Predictive analytics provide the foresight to understand cybersecurity risk exposure. Cybersecurity strategies often consist of “whack-a-mole” exercises focused on the perpetual detection and mitigation of vulnerabilities. As a result, organizations must re-think the ever-escalating costs associated with vulnerability management. After all, the daily flow of cybersecurity incidents and publicized data breaches, across all industries, calls into question the feasibility of achieving and maintaining a fully effective defense. The time is right to review the risk management and risk quantifcation methods applied in other disciplines to determine their applicability to cybersecurity. Security scoring is a hot topic, and rightfully so. When evaluating ways to integrate these scores into your cybersecurity strategy, be sure to look for an empirical approach to model development. 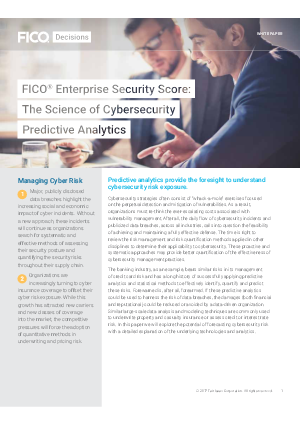 The FICO Enterprise Security Score is the most accurate, predictive security score on the market.